How to: Wings at Home! The KFC Sauceless Hot Wings commercials have been relentless as of late. They first came on and I scoffed. Out loud. But after seeing them over and over….and over…while watching the NFL playoffs, I decided to give in and try the “New” KFC Sauceless Hot Wings. YUM! Brands…your unrelenting advertising got the best of me. Forget all that. Let’s talk about the wings. I expected a popcorn chicken style breading and/or fritter style batter with spices mixed in. Watching the commercials I could practically taste them. I knew the cayenne pepper seasoning would tingle on the lips and throat. I knew the wings would be more crunchy than crispy. And, even though they’re not prepared anything like a traditional wing, I knew I was gonna like ‘em. Well, I was right on. The spicy, crunchy batter on the outside gives way to a steaming hot, moist and juicy inside. Many fast food wings or pizza joint wings end up too fatty. Almost gelatinous. (see Dominos) There’s none of that gross fat on these wings. The wings are on the small side. With the thick crunchy outside, they get pushed up towards medium sized. But the tender meat inside pulls off the bone with ease. The result is pile of flappers and drums cleaned all the way to bone. I would like the spiciness to be brought up about notch or two. There is a twinge of heat…but not much more. In fact, they barely register.They're spicy. But it's not really fair to call 'em "hot." 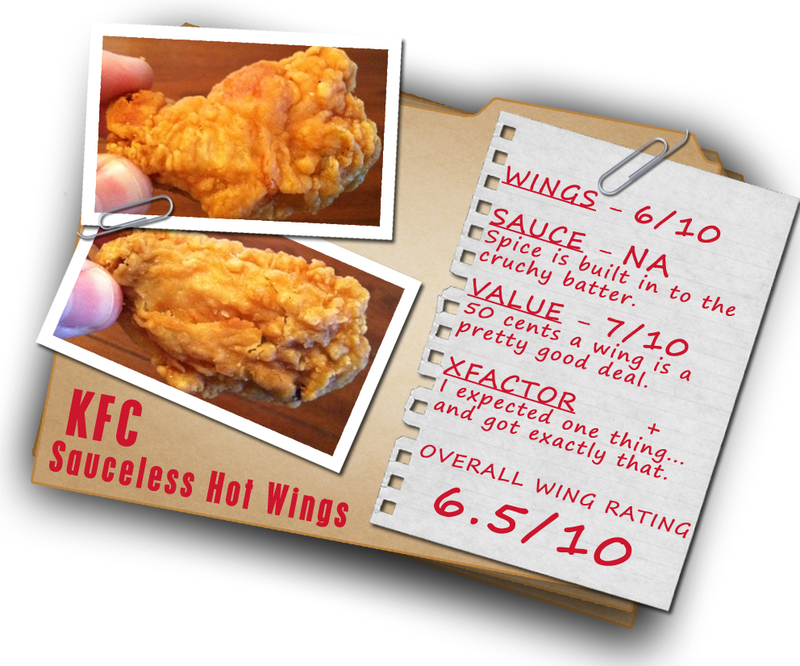 At 50 cents a wing…these are a relatively good value. Anything more than 50 cents though would be too much. So, get ‘em while they’re ala carte. Paired up in some 6 or 7 dollar value meal…the value would probably plummet. Bottom Line: These wings are pretty good. It’s just that simple. I know, they’re not traditional at all. Battered with no sauce?! Yeah. But I can’t help it. They’re good. At 50 cents a wing (as of this writing) they’re also a good deal. So head out and get ‘em while they’re still cheap…and while they’re still available. I’m pretty sure the “for a limited time” doesn’t just refer to the price. The KFC hot wings up here in PA are the size of sparrow wings, and they spend a good 8 hours drying out by suppertime. Whatta rip-off. I make sure to get their awesome KFC hot sauce with these and put that on them. My wife and I are going to try the wings tonight. Updates to follow if they are any good or not. Most of The KFC's in Rochester NY do not serve the Hot Wings...not sure why? Very Frustrating, they have the signs up but don't offer the wings at all. Which do you prefer? The Drum? Or the Flat? Copyright The Wing Review. Powered by Blogger.